Public Corruption Commission: Was Free Speech Suppressed Again at Taxpayer Expense for Political Gain? 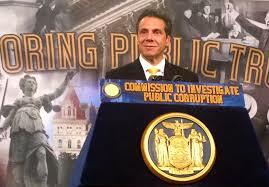 When the Governor of New York created the Commission on Public Corruption last year, there was much talk about his eventual candidacy for president. Then Hillary came along to upstage his aspirations and the Commission was suddenly disbanded with nothing to show for its year-long deliberations at taxpayer expense. Indeed a “dream team” of public officials and law enforcement was assembled in the wake of federal indictments lodged against members of the state Legislature and their co-conspirators. The Governor insisted that the crisis required a broad based investigation to reform the way the state does business in Albany. At the first public hearing of this Commission on Constitution Day, September 17, 2013, hundreds of speakers showed up for what would be a closed session. A long line of people was left outside waiting for hours, deprived access to the Pace University public forum. Only 17 members of the public were allowed to present testimony. Among them was Leon Koziol who spent more than 23 years litigating civil rights cases in federal and state courts. His eye-opening presentation can be viewed at approximately the 2 hours, 31 minutes and 45 seconds mark (Click Here). A very special thank you to Elena Sassower from the Center for Judicial Accountability, Inc., for providing us with this valuable link. Preet Bharara, the federal prosecutor who brought many of the indictments, was one of the elite speakers who opened the session. He later questioned the Governor’s sudden decision to disband this Commission, a body whose legitimacy was challenged in court because its unilateral creation was not properly authorized. The people were ultimately duped into believing that meaningful reform was actually going to occur. Instead, the Commission’s scope was quickly limited to select matter after this hearing and the public was disregarded in their concerns. Before its work could be completed, even the chairwoman resigned to run a campaign for congress. In the end, nothing came of this Commission and the taxpayers were left with a giant bill. As you go through the testimony bravely asserted by the people’s “Group of 17,” one cannot help but sympathize with the emotions and frustrations which these speakers demonstrated. We live in a society today in which an elite class of people is taking control, justice is being denied on an escalating scale, and violence is consequently emerging all across this country. It is high time that “We the People” take an increasing role in our joint destinies, support the reformists made subject to severe retributions, and show a real commitment to protect and preserve a truly American form of government under our Constitution.